Once upon a time, in a land far, far, away where whores had hearts of gold and looked like pretty extras in The Real Housewives of Beverly Hills, pimps were equal opportunity employers hiring girl bookkeepers, and smugglers had integrity and mourned their dead human cargo, a beautiful, downtrodden, tequila-drinking, spunky, athletic girl who could throw a punch rose to the top of the illegal drug trade, and retired to pregnancy, riches, safety and anonymity after avenging her husband’s death . . . the beloved husband being a pilot who was killed for stealing and reselling drugs that belonged to the Sinaloa Cartel. It sounds like the intro to Andrew Klavan‘s podcast, but it’s not: It is the plot of the hugely successful Mexican-Spanish soap opera La Reina del Sur, a cliffhanger Telemundo TV series based on Arturo Pérez-Reverte’s thriller of the same name. Make no mistake: Del Castillo’s character glamorizes crime to the point of making it a viable (albeit risky) career choice. As we know by now, Joaquin ‘El Chapo’ Guzman – whose family has registered several trademarks with the Mexican Institute of Industrial Property for licensing purposes – is an avid fan of both the drug trade-glamorizing series and its star, Kate del Castillo. El Chapo knows good PR when he sees it. Joaquin and Kate tweeted each other, expressed mutual admiration, and agreed to meet and discuss a tequila distributorship. Spaniard José Ibáñez-Martín Pira and Argentinean Fernando Sulichin traveled to El Chapo’s hideout in the mountains of Durango state with the two stars to discuss the possibility of filming the drug lord’s story. Now facing an arrest warrant by Mexican prosecutors who want to question her about her relationship with El Chapo, Del Castillo says she “feels betrayed and used” by Penn, according to her lawyer. 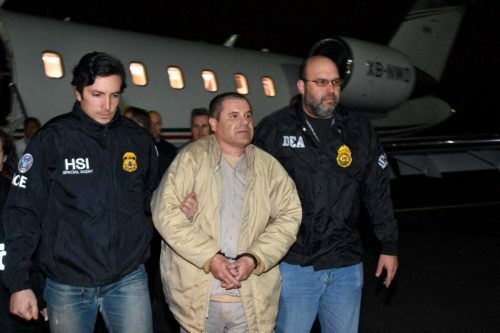 Penn’s photograph standing next to the world’s most powerful drug lord made headlines around the globe, as well as his Rolling Stone article and the short video included with it in which El Chapo answers several questions asked by one of his aides. But while Mexican authorities have said they will not investigate Penn, they insist on questioning Del Castillo for alleged money laundering and trying to set up a tequila business with Guzmán before he was captured on January 8. Of course, del Castillo’s lawyer vehemently denies any relationship between her and el Chapo. She would rather be questioned in the U.S. and not in Mexico, just in case. But fear not, Del Castillo’s lawyer says the biopic about Joaquín “El Chapo” Guzmán is going ahead.